The home of Aztech is a 24,000 sq. ft. light manufacturing and office space with a variety of energy conservation enhancements. This highly energy efficient space features geothermal heating and cooling in a highly insulated envelope. Seven geothermal wells, each 500 feet in depth, supply the heat source in winter and heat sink in the summer. The high bay shop space has radiant floor heating and the office areas utilize water to air units. Lighting enhancements include interior high efficiency fluorescent lighting fixtures controlled by occupancy sensors and exterior fixtures equipped with metal halide lamps. 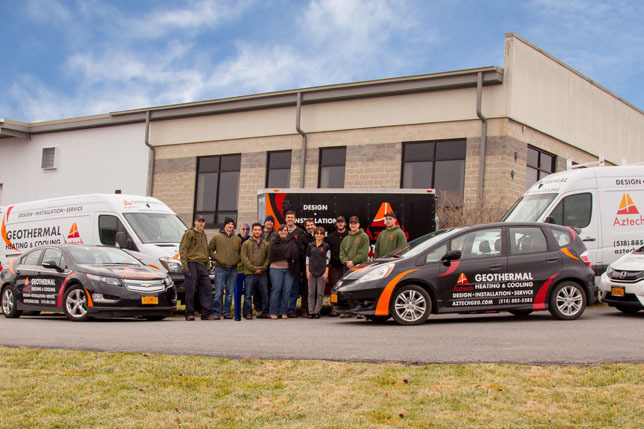 Aztech would like to thank NYSERDA, Saratoga Industrial Development Agency, and NYS Business Development Corporation for sponsoring the incentive programs that make projects like this possible.